In the midst of thinking that middle infield would be a tough position to forecast in 2014, three middle infielders made the top 20 on ESPN’s Player Rater. However, it did not include top-twelve selections Robinson Cano, Troy Tulowitzki or Hanley Ramirez. This seems to be carrying over to early ADP’s as people are reacting to the strong performances by Jose Altuve and Anthony Rendon who finished 1st and 17th respectively last season. Early on, each player is being taken in the top 15 in NFBC money drafts. The third player to finish in this company was Dee Gordon, who is not enjoying the early love as his other brethren due to questions of regression. But is Gordon really that much more of a question mark than the other two? That remains to be seen. At first glance, second base seems much deeper than in the past. There aren’t many discernible differences in either group. Player A does have a big advantage in batting average which enhances his value but that is also the one statistic with the largest variance. In the second group any one of the three players listed could out-produce the other with a bump in one category. Curious? Intriguing undrafted shortstops include Erick Aybar, Chris Owings and Alcides Escobar. I can see a bounce back by Jean Segura who endured a very tough season not only in his adjustments, but personally as well. Danny Santana is due to regress but how much? If he can steal 20 bases and score 80 runs then he still has value. Yes his average will drop to the .270 range but it depends on need. Javier Baez will be a very tough player to own since he will be streaky and may not break out until the second half. I think he is talented but to reach for him at pick 106 would be unwise. There are options if you do your research, just do not wait too long or you will find yourself with Jed Lowrie. Middle infield will have depth and some value to share this year. I think you can be successful without reaching or paying for career years. It will take patience but early knowledge of how players are being valued helps determine where to get them. Tomorrow I will take a look at the outfield. If you think there is variance in the middle infield, just wait. 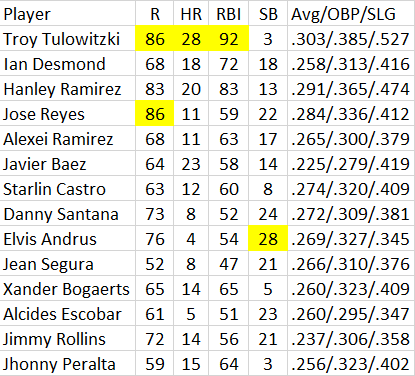 While there was surprising depth at catcher and first base, my research of second basemen shows much more of a chasm between the players to target against pitching splits in daily fantasy. This will also reflect in rankings for next year as players like Dustin Pedroia continue to lose traction in the ranks. 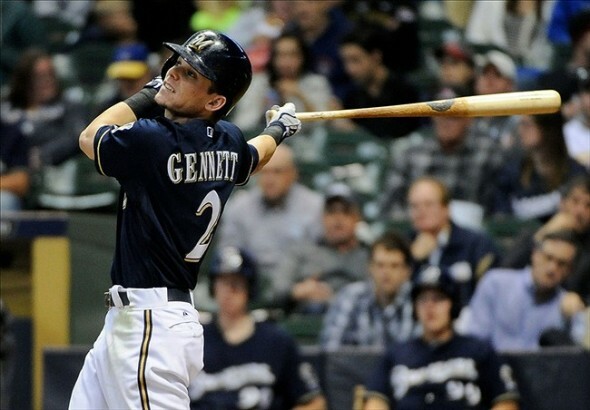 It also underscores just how good Scooter Gennett has been this year as both he and Neil Walker rank ahead of Robinson Cano based upon the advanced statistics used to rank performance in this article. For instance, would you think that Steve Tolleson has been better against left-handed pitching than Dustin Pedroia? Count me among those daily fantasy players who did not realize how good Steve Tolleson is against left-handed pitchers. It will be interesting to see if he can still get at bats against lefties once Brett Lawrie returns from the disabled list. The acquisition of Danny Valencia suggests a platoon with he and Juan Francisco at 3B may be in order. This would push Lawrie to a 2B role, which would limit Tolleson’s reps moving forward. 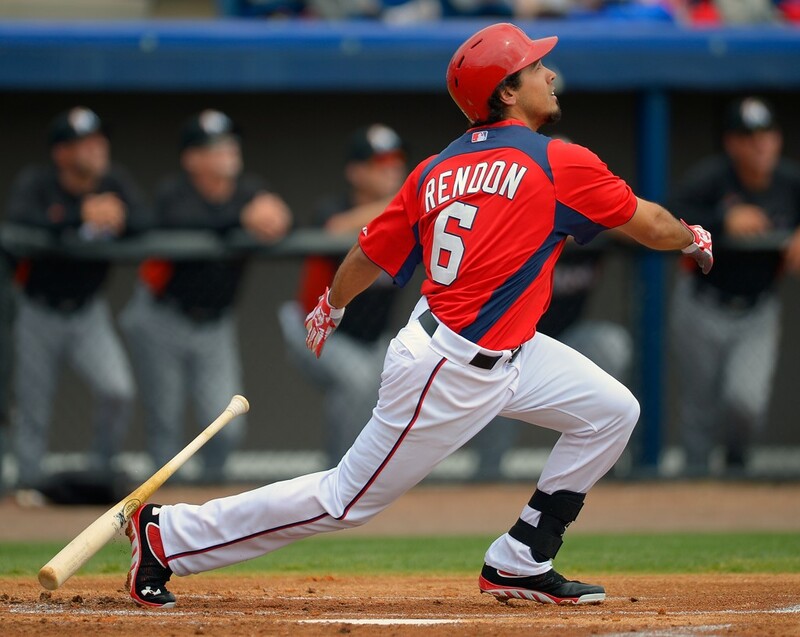 On a positive note, Ben Zobrist and Anthony Rendon are two options to target against southpaws moving forward. 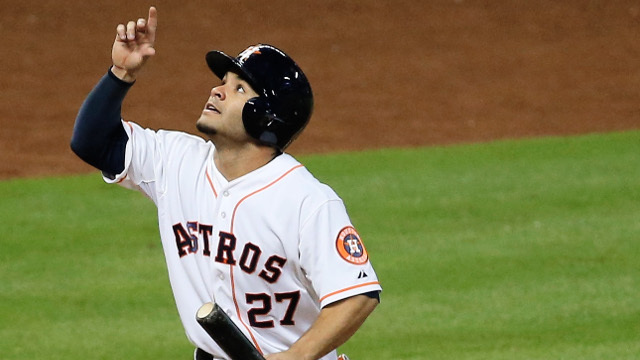 If you subscribe to the notion that “speed never slumps”, Jose Altuve is another great 2B to have in lineups against lefties with his 11 stolen bases and .421 batting average. Seeing Aaron Hill and Dustin Pedroia at the bottom of this list just exacerbates how they have struggled in 2014. By the way, where is Robinson Cano? Daniel Murphy made the top ten against lefties. In daily and year-long fantasy, the seasons by Neil Walker and Scooter Gennett have gone under the radar but by these guidelines they are the highest ranked second baseman against right-handed pitching this year. Robinson Cano’s slash lines are nothing to look down upon, but the surrounding lineup has more to do with his suppressed counting stats than the ballpark. In fantasy where a player bats is also vastly underrated, look at players like Jonathan Schoop and Roughned Odor. Their slash lines are not far off from Brian Dozier and Jason Kipnis but they bat 8th and 9th respectively in their team’s lineups. This matters for DFS as well, since more at bats mean more chances to score valuable points. 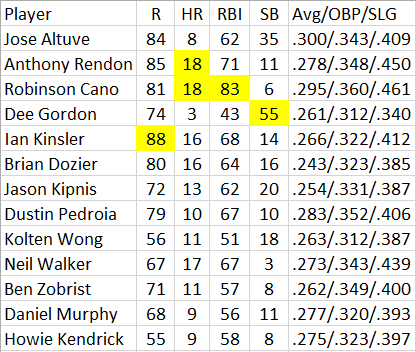 As noted earlier, Dee Gordon and Jose Altuve have stolen a combined 72 bags so if the power hitting 2B do not have good matchups, target the speedsters instead. A base hit, stolen base and run scored are equal to a home run in daily play and are easier to predict. 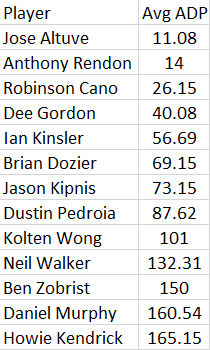 Like Pedroia above, this list underscores how much Jason Kipnis has struggled in 2014. Kipnis will either be a steal if his value is suppressed in drafts, or this is who he might be looking ahead. The remainder of the second half (Kipnis has struggled in second halves before) will help fantasy gamers better gauge his value. Last note: only Jose Altuve, Brian Dozer and Anthony Rendon qualified in the top 12 splits against both righties and lefties. The MLB season is upon us which means it is time for the Fantasy Baseball season. We here at the Sports Script want to do everything possible in setting you up for draft day and helping you throughout the season to win a Fantasy Baseball Championship. We are gathering a team of Sports Script writers as well as some special guest to answer 5 key questions about each position for the upcoming 2014 Fantasy Baseball Season. Today we have gathered myself (Ricky Valero), Matt Bell and Matt Wincherauk as we are going to take a look at the 2nd base. Matt Bell – I would be more than happy if I can snag Robinson Cano or Dustin Pedroia for my 2nd baseman this year, but I don’t like to use my early pick at this positions. The guy I’ll be targeting a few rounds later will be Matt Carpenter who hit .318 last year for the Cardinals. He’s still 2nd base eligible on most sites despite moving to 3B this year for the Cardinals. I really like what he can do for the Cardinals in the leadoff spot and can total up runs and RBIs given the Cardinals line up. 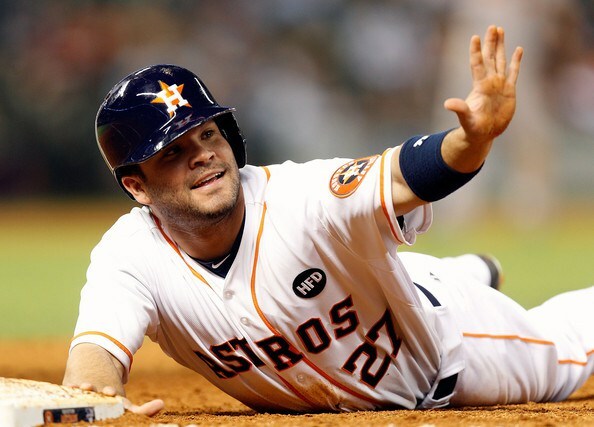 Matt Wincherauk – I’m looking to grab Jose Altuve this year. He’s a part of an emerging Astros team that has a ton of young talent. A great stolen base threat, and hopefully this will be the year that the rest of his offensive game takes off. Ricky – I am targeting Daniel Murphy. He was awesome in the 2nd half of the season hitting .307 after the break. We saw a nice bump in his stolen bases, while I don’t think he repeats that but he is a rare 5 category 2nd baseman. He has huge upside heading into this year and you can more than likely find him on all my fantasy squads this season. Matt Bell – I’ll be staying away from this year at 2nd base is going to be Brandon Phillips. He’s declined in average every year over the last 3 seasons and was only able to steal 5 bases last year down from 15 the previous season. He’s just getting older and I see decline in his future. Matt Wincherauk – Brandon Phillips is who I’m going to try to avoid this year. He’s already in a decline, and it doesn’t seem likely that he will be bouncing back to the Phillips of old anytime soon. He’s a guy who’ll get a lot of middle round looks based off name alone. Ricky – Robinson Cano – 1st round guy and moving to an unfavorable stadium (in Seattle) just equates to disappointment for me this season. He will produce but just not the numbers we are used to seeing or the numbers need to produce being worthy of a 1st round choice. Matt Bell – The Rangers traded away Ian Kinsler making room for Jurickson Profar to become the everyday starter for the Rangers at 2nd baseman. He’s got some major tools for a 2nd baseman as he can steal bases, hit for power, and just get on base. I really think Profar has a ton of value for a later round pick at 2nd base. Matt Wincherauk – I honestly feel like this is the year that we see Jurickson Profar take off, and be the star that we all think he will be. He’ll be getting a lot more regular time with Ian Kinsler in Detroit and should be ready to be a big time part of an explosive Rangers offense. Ricky – Chase Utley – I really like what he did in the final month of last season. He hit .349 with a pair of homers and 17 RBIs. I look for him to try to start 2014 as he finished 2013. Matt Bell – I hate to do this, but I feel like people are going to ignore what I say about Brandon Phillips for my answer to question 2 therefore I think he will be the biggest bust at 2nd base. I’ve already given all the reason I don’t like him this year, but he’s just to high ranked on most sites and will be taken way to early by many fantasy teams. Matt Wincherauk – Ian Kinsler shouldn’t be a major bust, but moving from Arlington to Detroit should take some getting used to. Besides just moving to a more pitcher’s ballpark, he’s also entering his mid-30s and isn’t the same player he used to be. Ricky – Brandon Phillips – While he celebrated a career high in RBIs, he saw his batting average, on-base percentage and runs continue on a 3 year decline. Owners will overpay and be disappointed in the result. Matt Bell – I haven’t mentioned his name yet in my questions, but another 2nd baseman I really like is Jose Altuve. I’ll actually go out and make the bold prediction that he will be a top 3 second baseman this year. Matt Wincherauk – Despite a drop off in power numbers, Robinson Cano will see a rise in his average, and will be an MVP type player despite leaving the friendly confines of Yankee Stadium. Ricky – Ian Kinsler will hit 20+ HRs and steal over 20 SBs. Kinsler moving over to the Tigers and hitting in that potent lineup should have some great results for fantasy owners. MLB season is upon us and Fantasy Baseball is back and better than ever! Over the next few weeks we are planning on getting you ready for any of the upcoming Fantasy drafts that you have. This week we are sending out our initial 2014 rankings that will be updated as Spring Training progresses. The week after we are going to answer 5 questions about each position as well as giving you some insight into some players that we like as well. Matt Bell is joining me today as we rank 2nd Baseman as well as take a look at one guy we like higher than his ADP and one we have lower than his ADP. Ricky – Daniel Murphy – Current ADP 14 – I ranked him 9th – Murphy is one of my big-time sleepers heading in the 2014 fantasy season. While his OBP isn’t great the rest of his 2013 stats were pretty impressive. He is a 5 category player (career high 23 stolen bases last year) and you honestly won’t get that from many other 2nd baseman. I believe he hits .280 with 13 HRs, 75 RBIs, 80 Rs and 15 SBs. Matt Bell – Ben Zobrist has an ADP of 6, but I’ve got him ranked 9th as I feel like he’s a bit of risk to be taken very highly. Last season he had a higher average batting wise, but saw a decrease in home runs, stolen bases, and RBI’s. They are slight decreases as I noted, but it as he gets older it’s just worth watching and I think there are better 2nd baseman behind him. Ricky – Aaron Hill – ADP 10 – I ranked him 14 – I have seen him as high as 6 on the rankings and I just don’t see it. His stats have been all over the place since 2011. You don’t know which Aaron Hill you are going to get. And the one stat (Stolen bases) that he provided an extra pop in, he only had 1 in 87 games last season. I just don’t trust him. Matt Bell – Jose Altuve is a guy I’ll be targeting in just about all my drafts as he has an ADP of 7, but you will see him ranked slightly higher at 6 in mine. I know that’s not a big difference, but I feel he could be even higher among 2B this year. Altuve gets a little lost in drafts because he plays for Houston, but he’s young and has a ton of speed on the base paths. We’ve had a great 1st half of baseball this year! The Sports Script asked Ricky and me 10 questions regarding the 1st half of the season. We’ll be talking about what’s happened so far this year, as well as predict how the season will finish. 1. Who is the biggest surprise team? The Pittsburgh Pirates. After finishing the last 20 years on the wrong side of .500, the Pittsburgh Pirates have seemed to amass a winning formula. Known for draft picks that didn’t pan out and veteran signings that fell through, this season the pieces appear to be falling into place. With acquisitions such as Francisco Liriano and Jeff Locke, joining A. J. Burnett and Gerrit Cole in the rotation and a talented bullpen, the pitching has been the heart and soul of the Pirates’ success. Andrew McCutchen and Starling Marte’s outfield performances have been electrifying. With the fourth lowest payroll in the majors, GM Neal Huntington’s bargain shopping appears to be paying off. The splashiest moves in the off-season don’t always translate into regular season success. The 2013 Toronto Blue Jays are a prime example. After the trade for shortstop Jose Reyes, left-handed pitcher Mark Buehrle, right-handed pitcher Josh Johnson, catcher John Buck, the acquisition of free agent Melky Cabrera and knuckleballer R. A. Dickey from the New York Mets, the Jays were an early favorite to win the division. With a division-worst 45-48 record, they are falling miserably flat. Following a poor start to the season, the Jays recovered slightly but in the midst of a strong A.L. East, there is no room for mediocrity. With a sorely under-producing rotation, in order to contend with the Boston Red Sox, the Baltimore Orioles, the New York Yankees, and surging Tampa Bay Rays, their acquisitions will have to produce. Although still early in the debate, Miguel Cabrera of the Detroit Tigers is a runaway favorite for MVP consideration. Aside from Chris Davis of the Baltimore Orioles, there is no other major league player whose numbers even come close to touching Cabrera’s. With an impressive 95 RBI’s, 30 HR’s and batting an average of .365, his production in the Tigers’ line up is extraordinary. In the NL, Catcher Yadier Molina of the St. Louis Cardinals isn’t a “typical” MVP candidate. With only 7 HR’s in 2013, he isn’t your power-hitter, however, his real strength comes in his batting average at .341 (with 49 RBI’s) on the year. He has thrown out 45% of attempted base-stealers. With a 4.0 WAR rating, Molina ranks second only to Cabrera and has started behind the plate in nearly every game, proving his durability. Perhaps most importantly, Molina is the backbone of the division-leading Cardinals. Max Scherzer of the Detroit Tigers finally lost his first game of the season this past weekend but still leads the majors with only 1 loss. While wins-losses can be overrated, they are not meaningless. With an ERA of 3.19, Scherzer leads the league in strikeouts with 152. Adam Wainright of the St. Louis Cardinals has 12 wins and 5 losses, an ERA of 2.30, and is second in the National League with 126 strikeouts. Wainwright has had 2 shutouts on the year and an impressive 14 walks in 19 games. This past off-season the Atlanta Braves signed B.J. Upton to a 5-year, $75.25 million deal, the biggest contract in franchise history. Hitting a dismal .177/.266/.300 on the year, Upton is looking like a poor investment. He is struggling at the plate with 102 strikeouts half way through the season. His timing is poor, he shows too much movement in his swing, and any adjustments he has tried to make haven’t proven effective. In fact, Upton appears to be regressing as a hitter. Braves manager Fredi Gonzalez admitted he considered asking Upton to work out his struggles in a minor league assignment. Currently Upton has been placed on the 15-day DL with a right adductor muscle strain. Throughout the season many have speculated whether the Phillies would be sellers before the deadline with the likes of Chase Utley, Michael Young, and Carlos Ruiz. However following a strong July outing, General Manager Ruben Amaro reportedly announced the Phillies could be buyers, not sellers. With the Atlanta Braves, who started the 2013 season red-hot, slightly slowing down their pace and the Washington Nationals falling short of expectations, a strong addition to the roster could give the Phillies a push for the post-season, if any is to be had. If the Phillies go the selling route, there could be great value for Utley, Young, or Ruiz in the trade market. With a record of 44-49 the Angels are heading into the All-Star break below .500 and 12 games out of first place in the NL West. However, they have the ability to recover. If they are going to gain ground in the second half of the season they need a boost from their pitching staff (particularly ace Jered Weaver); the offense needs to live up to its potential and they need to win the games they are supposed to win. This season against the less than stellar Astros, the Angels have gone just 6-7 included being swept by Houston in a 4 game series. Their big off-season acquisition, Josh Hamilton, had a bleak start to the season but heading into the weekend has hit .346 in his last 14 games with 12 runs and 4 HR’s. Hamilton needs to break out in the second half. Injury-riddled Albert Pujols has also had a weak first half of the season but if last season is any indication (slugging jumped from .460 to .581 in the second half), he should start to improve. His bat returning to previous form will provide a much-needed bolster to the Angels’ line-up. AL 8. Will Miguel Cabrera win the Triple Crown for a 2nd year in a row? No. While Cabrera is certainly making a case for a repeat Triple Crown the one category that will hinder him is power-hitting. Cabrera has 30 HR’s heading into the All-Star break, second to Chris Davis’ 37. While either hitter could slow down in the 2nd half, it will be difficult to top Davis’ power. With Davis finishing out the 1st half with 93 RBI’s, 37 HR’s, and a batting average of .315, he may also be a Triple Crown contender. At the very least, his numbers will threaten Cabrera’s. The National League does not boast the same power-hitting numbers as the American League. Currently Carlos Gonzalez of the Colorado Rockies leads the NL with 25 HR’s, Pedro Alvarez of the Pittsburgh Pirates has 24, and Domonic Brown of the Philadelphia Phillies has 23. While the HR leader at the close of the season is a toss-up, Coors Field, the home of the Colorado Rockies is known for being a home-run friendly ballpark due to the high altitude, which could give Gonzalez an advantage. 9. Which 5 teams are making the playoffs? We’ve had a great 1st half of baseball this year! The Sports Script asked Maria and me 10 questions regarding what took place during the 1st half of the year and predictions for the rest of the season. 1. Who is the biggest surprise team? The Pittsburgh Pirates – They have had one impressive 1st half of the season. Their pitching has been unbelievable; they have the #1 ERA in all of baseball right now. What’s even more surprising is the fact they are winning so many games in spite of how badly they’re hitting this year. 2. Who is the biggest disappointment? At the beginning of June this would’ve easily been the Dodgers, but now it has to be the Nationals. They are only 1 game above .500 and just haven’t been playing the best baseball. They just aren’t hitting at all and they’re ranked in the bottom half of every major hitting category. 3. Who is the MVP? Miguel Cabrera – Chris Davis gets an honorable mention in this but nobody is playing as well as Miggy. He is hitting .365 with 30 HRs & 95 RBIs. He could be on his way to winning his 2nd Triple Crown and MVP in a row. 4. Who is the CY Young? I would say there are 4 or 5 names that could be tossed into conversation, but I am going with Patrick Corbin. He is 11-1 with a 2.35 ERA, 109 SO, and a 1.00 WHIP. He has only given up more than 3 runs twice in 19 starts, and has held teams to 2 runs or less in 15 of those. While others can still stake their claim, give me Corbin right now. Max Scherzer – This guy is 13-1 with a 3.19 ERA, 152 SO & a 0.98 WHIP. There really is no other choice here to be made. 5. Who is the Least Valuable Player? After starting the season hot, Justin has hit a cold streak, while his brother B.J., has just been terrible all season long. They have struck out a combined 202 times. The Braves have invested a lot of money in the pair and they haven’t produced the way they should’ve. 6. Which team needs to make a move at the deadline? They need a closer and they need one right now. If they do not trade for a dominant closer, this team will not go to the World Series this year. 7. Which team is most likely to bounce back in the 2nd half? They aren’t playing anywhere near what they are capable of. I think they are poised for a good 2nd half where they will overtake the Braves and win the NL East. 8a. Will Miguel Cabrera win the Triple Crown for a 2nd year in a row? I believe he will. I think Chris Davis is going to hit a wall in the 2nd half (Like Jose Bautista did in 2010). This will give Cabrera the opportunity to overtake him in the HR race. 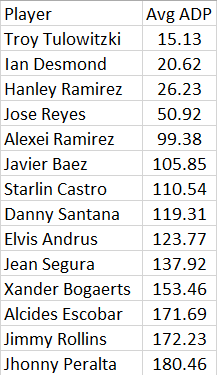 8b.Who will finish with the most HRs in the NL? This is a race to keep an eye on. Gonzalez, Brown, Alvarez, and Goldschmidt are all within 4 HRs of each other. Beltran and Bruce aren’t far off either. If he is healthy, Cargo will end the season with 42 HRs, which will lead the NL. Wild Cards: Dodgers & Braves. Wild Cards: Yankees & Angels. 10. Who is representing the NL & AL in the World Series? I originally picked the Braves to not only represent the NL in the World Series but to win it as well. Well, time for me to take my comment back. The Braves have too many questions surrounding them, the D’Backs aren’t there yet, the Dodgers aren’t unless they trade for Lee, and the Nationals aren’t ready for it yet. So, with the experience and talent, the Cardinals will be in the World Series for the 4th time since 2010. At the beginning of the season I had the Tigers representing the AL. I will stand by that pick now as well. The Rays I think have the right amount of pitching to make it, but not sure they have the hitting together. The A’s always seem to get there but can never make that final push. Yankees aren’t good enough, and the Angels could go, but aren’t deep enough in the rotation to make it. So that leaves me with the Tigers, and I think that is by default as well. They have been really solid with their Starting Pitchers, but their bullpen has been atrocious this year. As I said, they will fix this issue and trade for one at the deadline, to take home the Crown in the AL.